Or womankind, in this case. See, I’ve been reading horsy stuff. If my horses knew this, they would run away. Unfortunately, the poor unenlightened creatures have to suffer the effects of me reading horsy stuff, which usually include more/harder/new work for them. First, I watched with great interest as my favouritest horse blogger The Sprinkler Bandit rocked around a cross-country course on her cute OTTB. Then my almost favouritest horse blogger The Rubber Curry Comb was having fun over sunken roads and other exciting obstacles. 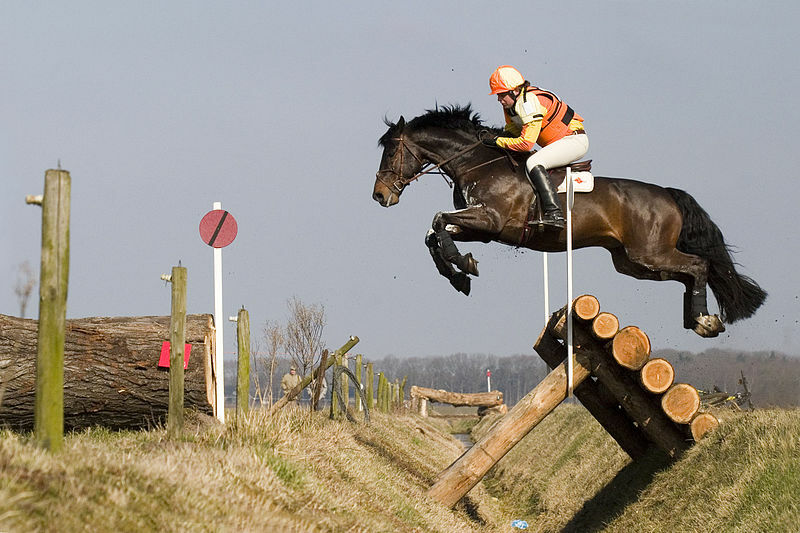 Not along ago I published a blog post on eventing at eQuest for Truth. And then I was like, well, why not us? I mean, the Horse Mutterer had even given me a body protector (which I, eyeing the numerous unbacked horses at the stud, filed under “very ominous”). Plus, Arwen has been schooled for showjumping as well as dressage. Why, the Mutterer himself said she would be a nice little eventer. Arwen’s infinite trainability always makes her the guinea pig. She’s done dressage, showjumping, outrides, some rather peculiar groundwork, and Western mounted games. By now, she’s pretty used to her human trying get another fool idea and saving aforementioned human from making an idiot of itself. So yesterday I built us a log pile. Not a proper one, unfortunately. I took a couple of tyres and then lined up four unpainted poles on top of them, stacked another three on top of those, then two right on top, creating about a 50cm solid-looking heap. (50cm is a baby jump, but it was quite big enough for me given what could happen if she decided to crash into it. Besides, I was running out of poles). I grabbed the unsuspecting Arwen and we charged off to get to work. We warmed up quickly because we were losing the light; a couple of walk circles, some working trot laps and circles (with a bit of light seat thrown in cuz I need leg muscles), and then a few laps of a nice, relaxed, forward canter. She rushed through the lead change, but I decided to choose my battles and focus on the jumping. We warmed up over a 1.10m vertical. I brought her in too close for some really dorky rabbit hops a few times, but she took everything in her usual willing way. Her canter was miles better than last week; she was relaxed, responsive, calm but eager. In fact, by the time we were done jumping the vertical, Arwen felt amazing. There’s a certain feeling you get when you’re riding your best and your horse knows it and gives its best for you. You feel utterly in balance and poised upon the movement of your horse, which is calm and focused, every ounce of its attention on the job. The horse is perfectly on the aids, and so you feel like you’re just sitting there, guiding it with the merest touch of your leg, squeeze of your finger or shift of your weight. This is the time when voice commands seem utterly ridiculous; you communicate effortlessly by touch and in silence. Best of all, there is absolutely no resistance in the horse towards you. None. Your aids just flow through it, and it does exactly what you want, but willingly and eagerly, as if that was what it also wanted to do all along; its whole body is working and supple. You two work as one. In dressage, this is known as losgelassenheit, but whatever you want to call it, it’s pretty awesome. Arwen gives me moments of it now and then, and yesterday we had it. With this awesome feeling, I took my wonderful, losgelassenheity horse towards the log pile. 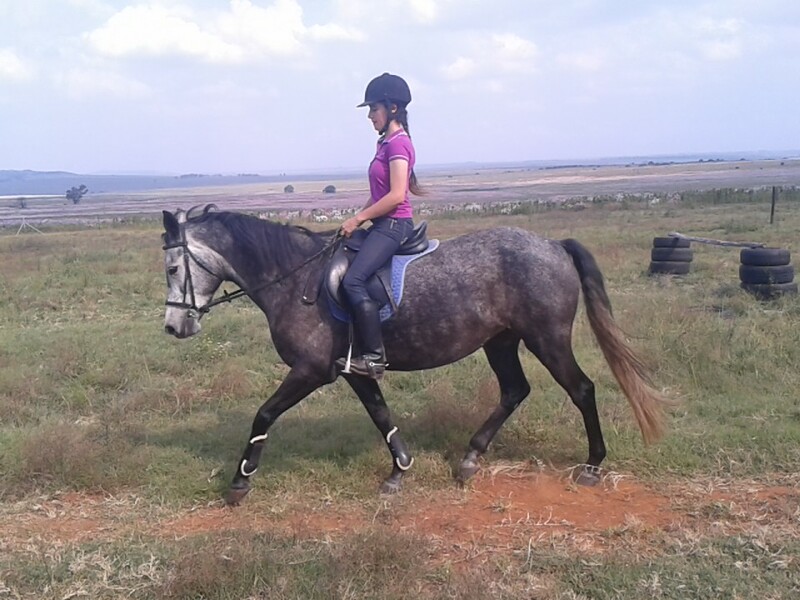 She cantered towards it happily until about two strides out, where she went “OMW lady why all the poles?? ?” and hesitated. “Just jump,” I ordered, firming my legs around her. She shrugged equinely and popped over without a problem. The next time we circle around, she had a look, I ignored the look and she jumped again, no worries. After that we just had fun gliding over the tiniest log pile in the universe like it didn’t exist; eventually each jump was barely a break in her stride and I decided to call it a day before she got too blasé and tripped over it and broke our silly necks. Looking for cross-country facilities in our area now. Eventing world, here we come.